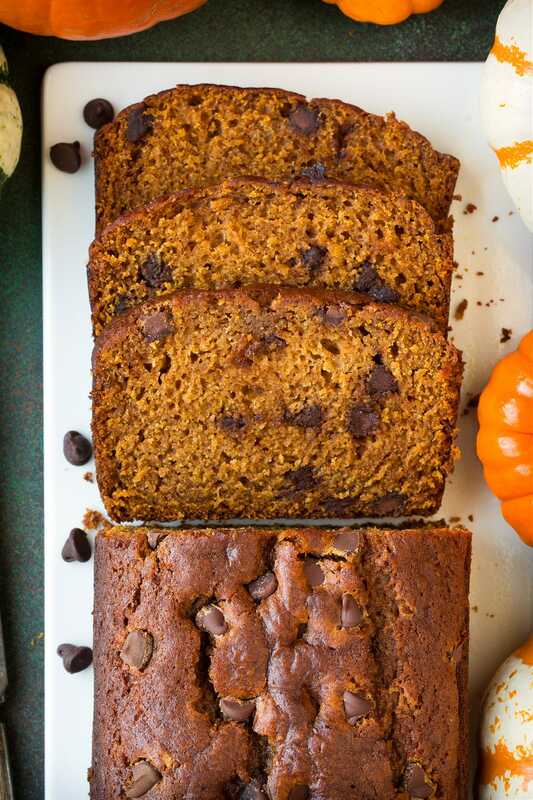 Pumpkin Chocolate Chip Bread is an absolute fall must! 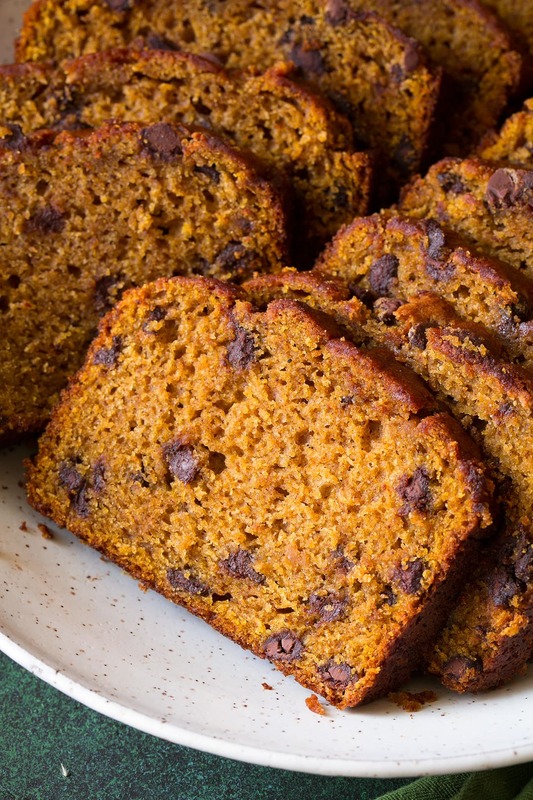 It’s brimming with that pumpkin and spice flavor we crave, it has the perfect amount of chocolate chips, and it’s amazingly moist and tender. This is how you welcome fall. 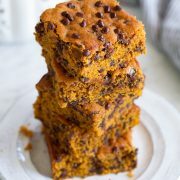 And in my opinion this is the perfect loaf of Pumpkin Chocolate Chip Bread! It has a blend of oil and butter, oil for moisture because it creates a more moist crumb than butter does but then we need some butter for flavor. Then there’s a fair amount of cinnamon here and just enough nutmeg, ginger and cloves. 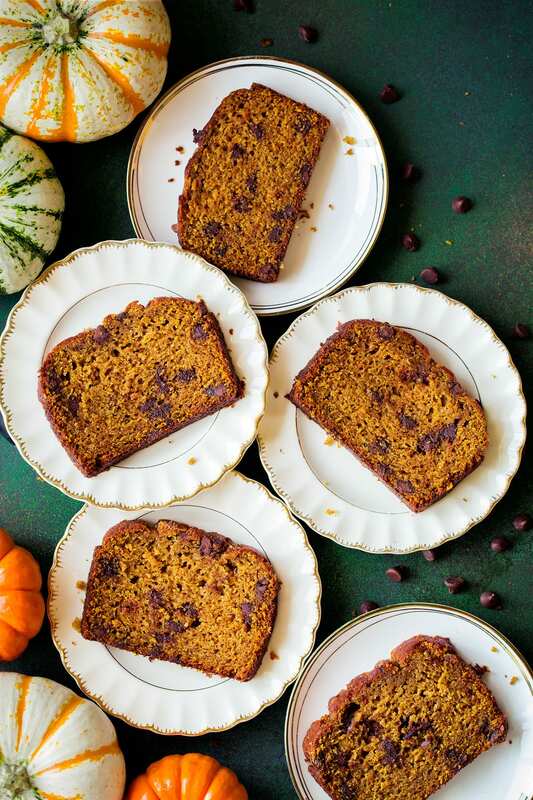 Because pumpkin bread wouldn’t be pumpkin bread without those autumn spices! And I like the blend of white sugar and brown sugar for flavor. 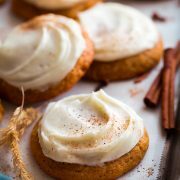 A hint of molasses with pumpkin is always a good thing (the molasses being that from the brown sugar). Preheat oven and grease loaf pan. Whisk together dry ingredients and chocolate chips. Make a well in center. Separately whisk together granulated sugar, brown sugar, melted butter and vegetable oil. Whisk in eggs them pumpkin, apple juice and vanilla. Pour pumpkin mixture into flour mixture and fold until combined. Bake in preheated oven until toothpick inserted into center comes out practically clean. If at all possible make this bread the day before you plan on serving it. The flavor, texture and moisture is just better the second day. Don’t over-mix the batter. That way it will rise up nicely. 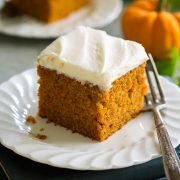 If you don’t have all the spices here use 1 Tbsp pumpkin pie spice instead. For less fat substitute unsweetened applesauce for vegetable oil. Cool completely before slicing otherwise the slices will sort of crumble. Double the recipe if desired to make 2 loaves. 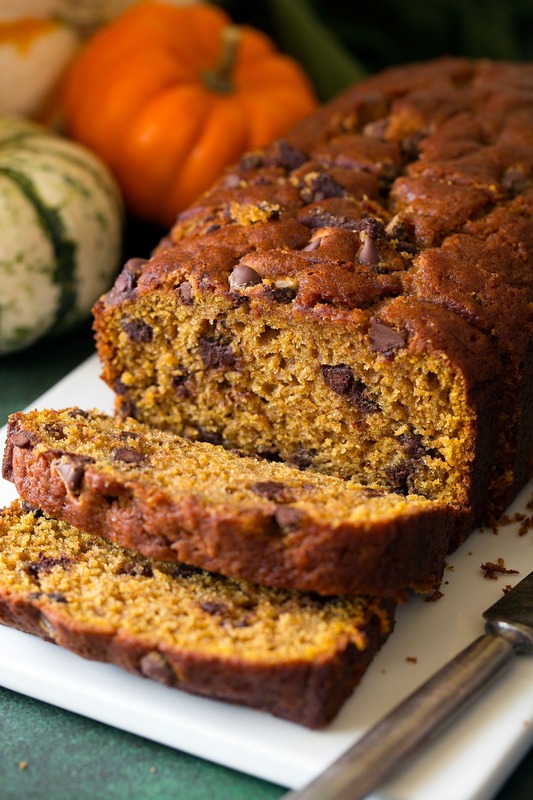 This is my favorite Pumpkin Chocolate Chip Bread recipe! 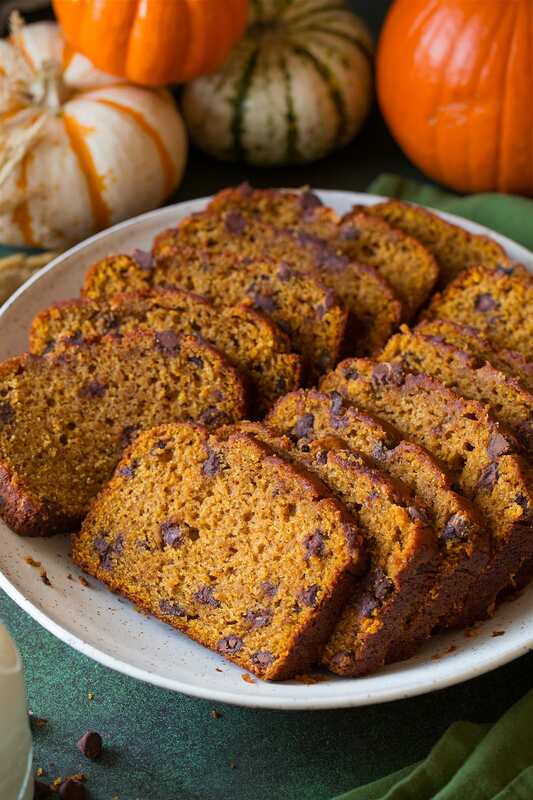 It has the perfect amount of that pumpkin and autumn spice flavor, just enough chocolate chips, and it's oh so moist and tender. It's a fall must! Preheat oven to 350 degrees. 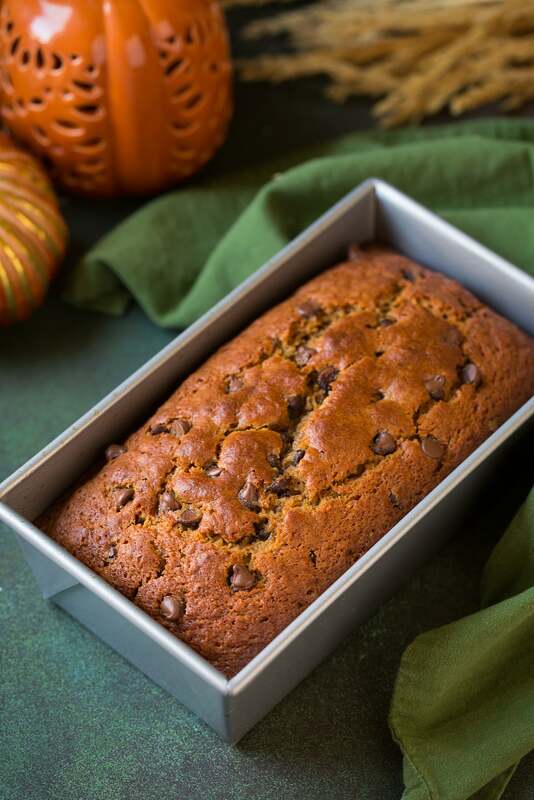 Spray a 9 by 5-inch loaf pan with non-stick cooking spray, set aside. In large mixing bowl whisk together flour, baking powder, baking soda, salt, cinnamon, nutmeg, ginger, and cloves. Mix in chocolate chips. Make a well in center of flour mixture then set aside. In a separate medium mixing bowl whisk together granulated sugar, brown sugar, melted butter and vegetable oil. Add in eggs then whisk until blended. Add in pumpkin, apple juice and vanilla and whisk until well combined. Pour pumpkin mixture into well in flour mixture and fold and stir with a rubber spatula just until combined. Pour into prepared loaf pan. Bake in preheated oven until toothpick inserted into center comes out practically clean (a moist crumb or two is fine, but no batter), about 55 - 60 minutes. Cool in pan for about 5 minutes then run a knife around edges of loaf to ensure it's loose. Invert onto a wire rack then turn upright. Cool on wire rack about 30 minutes then transfer to an airtight container to cool completely. Note that it's even better the second day.